After an excellent bacon buttie to get the day started, we slipped from Gosport marina at about 10am. We had run through the routines for getting the spinnaker hoisted before slipping our lines but the winds were too strong at around 15kts – gusting even higher. We had the sails up very soon and sailed out of Portsmouth harbour and made our way out via the main transit and then west towards Southampton. We elected to sail around Bramble Bank via the North Channel and then sailed into the Beaulieu on a beam reach. Lou sailed us onto a buoy which Jim lassoed and then for lunch. Sailing off the buoy was fairly uneventful and we short tacked our way against a gentle tide with only moderate traffic to be aware of – one under power who well knew we were sailing and another smaller sailing yacht where we were able to time our tack to cross behind her stern. 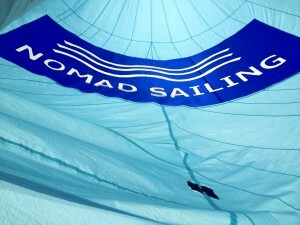 Once out on the Solent again, the wind had died down to barely 5-10kts so we were able to easily fly the spinnaker. During the course of the next hour we completed several gybes to get the principles sorted and then headed back up to Southampton Water and moored up against the main jetty for dinner at the Bugle.